Tony Lorenz (email): Hi everyone, I still need response to the question of the issue "What is your favorite Titan's cover and why?" Mark Metz: I think I have to go with New Teen Titans 21 (the Baxter version). 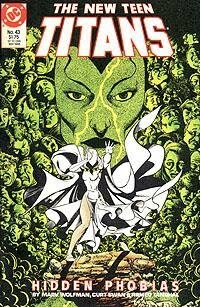 The image of the Titans fallen in the know imaged within Cheshire's green costume has always been one of the most striking covers of the series to me. I had dropped Titans before that issue, but later, I had to have that one for the cover alone. It's everything a photoshop user like me wishes I could draw myself rather than use an application to do so. George's artwork her is truly amazing. That is my favorite cover of the Teen Titans by George Perez. The cover introduces three new characters, all in a very heroic stance. In each of the background, it tells the story of the character. This is definitely one of the best cover ever made!